Probably the most surprising stop on our OKC bus tour was this boxy concrete church on North Portland Avenue. We were amazed that we'd never come across this unique structure before. The Saint Patrick Catholic Church was designed by Tulsa architectural firm Murray-Jones-Murray in 1962. This is the same group that gave us the Tulsa International Airport, the Saints Peter and Paul Catholic Church and many more fine examples of the International Style. But this church takes the simple, rectilinear lines of that style and turns it up a notch. From the outside we have a Brutalist structure of concrete walls. The parish members actually helped set the forms for these huge poured-in-place wall panels. 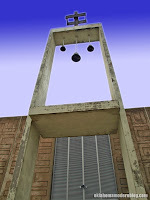 The front of the building is dominated by a massive bell tower entryway. But pass under that and the fun begins! Inside the concrete box is a glass box- this is the actual sanctuary. 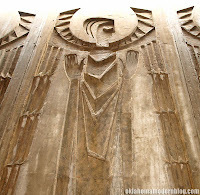 But the first thing you'll notice inside are the modernist angels molded into each of the concrete wall panels. Towering over 30 feet high they dominate the wide corridor between the outer and inner walls of the building. But wait... looking up from here you can see a sliver of blue sky. You're still outside! A series of eight concrete "umbrellas" make up the roof of the sanctuary. But the perimeter of these roof panels are not connected to the outer walls you see from outside. The entire interior is surrounded by a sort of courtyard, all overlooked by the stylized angels. My apologies if that description sounds confusing, it's a difficult to describe building. If you'd like to give it a try visit the church at 2121 N. Portland Avenue in Oklahoma City. It appears that the altar screen was designed by Josef Albers, the great Bauhaus artist. I definitely want to see this next time I'm in OKC.